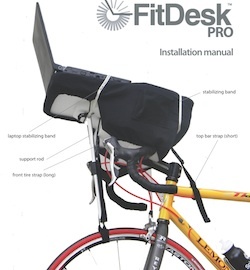 With the FitDesk you can truly pedal at your desk because your bike and desk are all one unit. 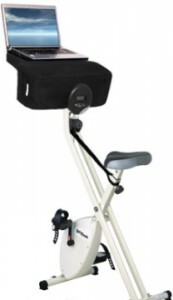 Lightweight and can fold away for storage the FitDesk provides comfort while you exercise and work. The ‘desk’ has removable and washable cover and a comfortable spot for your elbows and room for your laptop, keyboard, or book. There are pockets on each side of the desktop for office items, phones or whatever you need to put there. The resistance on the pedal is easily adjusted with a knob and the seat can be higher or lower for the right fit. Calories burned, time and distance are tracked by the onboard computer for quick and easy reference. 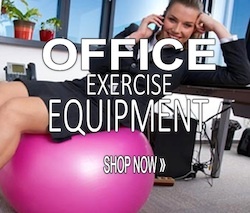 If its past closing time and you still have a lot of work to do at the office – you won’t have to miss your cardio workout with the FitDesk in your office. Reward yourself with fitness and health for a job well done. 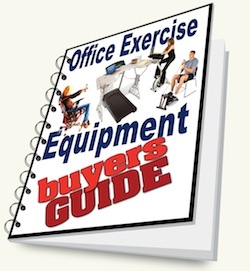 Even moderate pedalling while working, watching a presentation or taking on the phone will benefit you over time . Did you ever get a ‘bad report’ at work? With the FitDesk you will be able to take your frustrations out on it. The madder you get the likely result is you will pedal even faster. Two, every time your boss makes you mad you can now thank her or him for helping you burn calories. 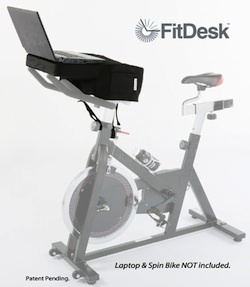 If you already have a spin bike or set your road bike up on a spinner like I do, the FitDesk PRO is a way to turn them into a productive exercise bike desk. Easily assembles to most styles of bikes so within seconds you have an effective bicycle desk. I will confess, when I jump on my bike on the spinner, I usually watch HBO. New studies have been showing that people who workout before going to work – or worked out on their break – were much better prepared for unexpected tasks. Their moods were better and they were more alert on days they exercised proving that exercise during work hours has a definite mental benefit over and above the obvious physical benefits.